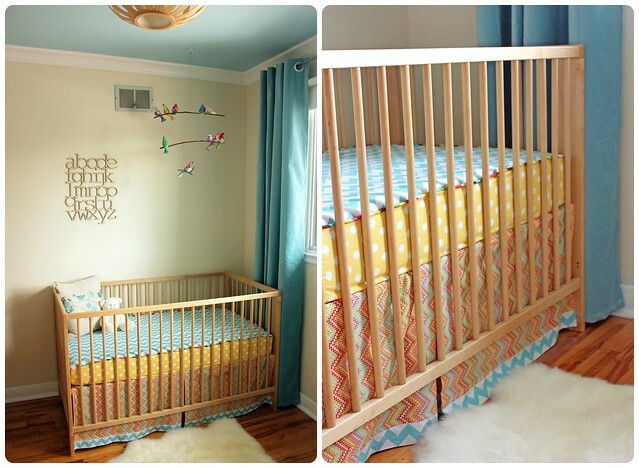 April 03, 2013 in "Life", "baby", "our house"
The baby's room is ready! 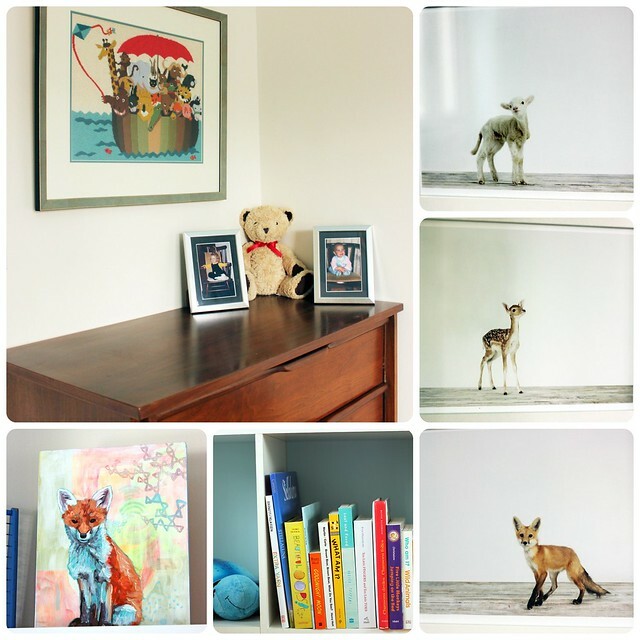 We've been working on it on and off for a while now and have just recently put the final touches on our baby's space. 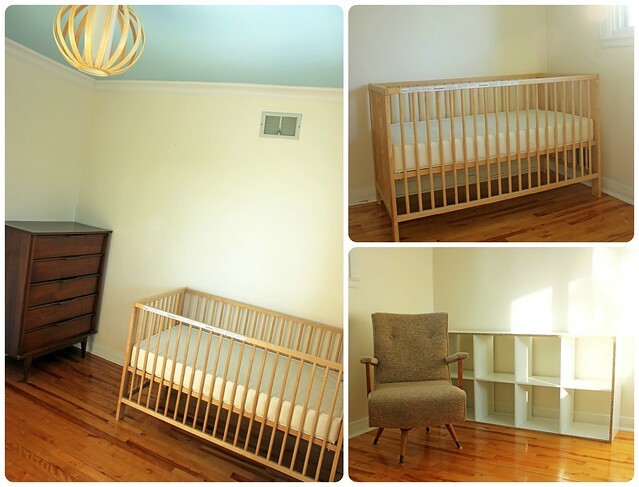 I know that lots of people do not think of the nursery as a priority. 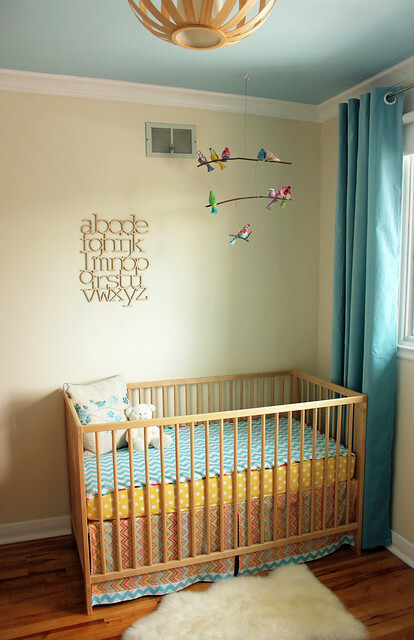 The baby won't know the difference whether he/she's in a beautifully decorated space or a cardboard box. That rational makes a lot of sense, but not for me! I'll know the difference. I expect to spend a lot of time in this room in the coming months, and I'd like it to be a space that I can enjoy. I've loved every step of planning this room and when I walk into this space now, I love it! It makes me so happy. Having a lovely and organized space will definitely help me relax during late night feedings! 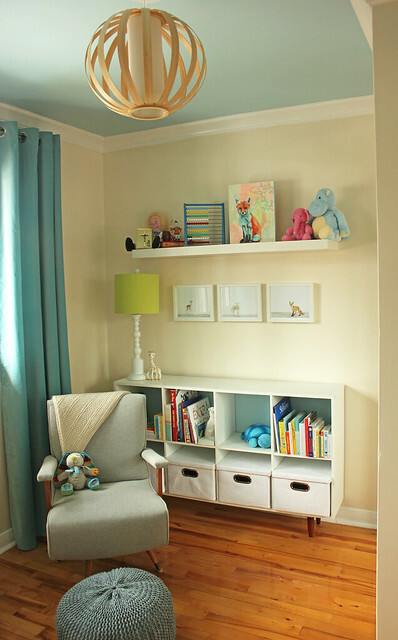 Chaos and clutter stress me out, I need a calm and soothing space for me and my baby. 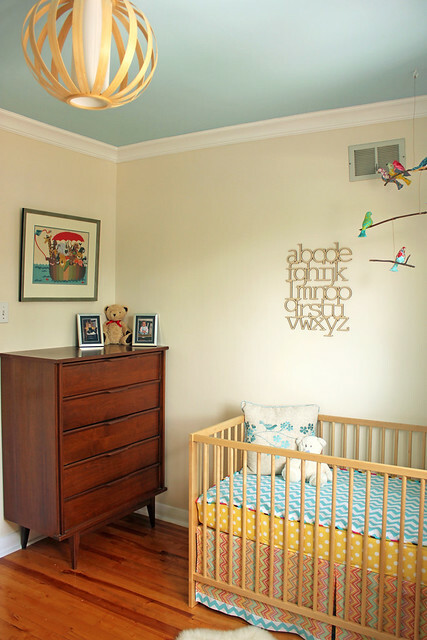 The room is quite small, it's perfect for a nursery, but is definitely not a large space. We had the chair reupholstered in a blue/grey tweedy fabric. I love how it turned out! We purposefully picked a fabric that would work well anywhere, if I eventually move this chair to the living room, it'll look great. We spruced up the shelves by putting on a backboard and painting it the same blue as the ceiling, we finished off the raw edges with iron-on melamine tape and raised it off the floor by attaching 4 teak wooden legs. The legs match the chair legs and the finish on the dresser. There is lots of room to grow in this space. All those storage boxes on the bottom shelf of the cubby are empty! The closet has 4 shelves and a hanging rod that are mostly empty and the dresser has a bunch of teeny tiny onesies in the top drawer and not much else! We've got art and books! The Noah's Arc needlepoint was made for me by my mother when I was a baby. I remember it hanging on the wall above my bed my entire childhood. Mom passed it down to me for Christmas this year and it's so special. We put baby pictures of me and Chris on the dresser (funnily enough, both adorable baby shots are of us sitting in rocking chairs! Random, but awesome.) so we can play that fun game "who does baby look like?" 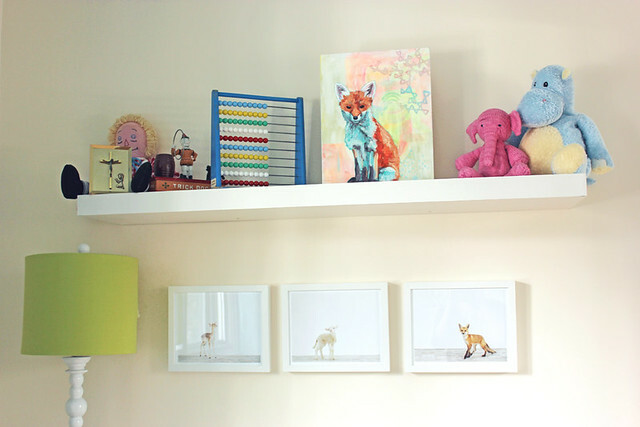 We've got photos of baby animals and a beautiful baby fox painting made for us by my very talented friend Sara. Of course there is my bird mobile and the crib bedding I've hinted at several times! I picked out the multicoloured, polka-dot chevron fabric first and then chose a few other coordinating fabrics to go with it. I love how the bedding came out. Mom and I spent a day making it, it was a lot of work and a lot of math! But it's perfect.